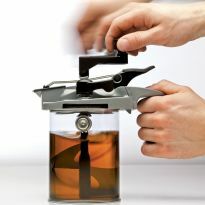 Stir, pour, and store in an instant with one ingenious tool! The Mixing Mate® Paint Lid makes mixing and pouring paints and finishes as easy and mess-free as pouring syrup from a restaurant-style dispenser. Forget the lid opener, stir stick, punching holes in the rim with a nail and hammer, paint pouring down the side of the can, and trying to bang the lid back onto a gummed up rim without deforming it. The Mixing Mate® Paint Lid eliminates all of these problems. 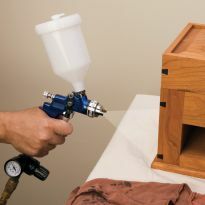 Whether you're pouring paint into a tray, or stain and varnish into your paint gun, you'll appreciate the easy, drip-free action offered by the Mixing Mate®. Simply crank the handle, press the thumb lever and pour. No drips, no mess, no wasted finish. 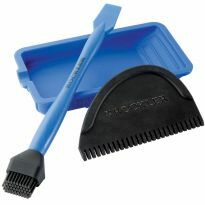 The auger-style mixing paddle lifts pigments from the bottom of the can, doing in seconds what would take minutes with a messy, wasteful stir stick. And when you're done, simply set the can back on the shelf for storage. 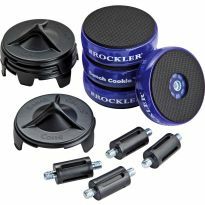 Also available from Rockler, the Mixing Mate® Quart Size Paint Lid. Works great, I have one for Shellac and one for Lacquer. Saves time and no mess. Where have you been all my life? I will never, repeat for emphasis: NEVER tackle a painting project without one of these! Nice product. Allows for mess free mixing and dispensing of paint. The parts are also very easy to clean. Worked better than advertised, will use for all future painting projects. I have purchased and used several Mixing Mate Paint Lids, since we have several paints, primers, and stains that we use frequently. I love the convenience of being able to stir and pour the paints and stains without making a mess or ruining a lid while trying to remove it. I have had no difficulties with the fit. I don't find that the paint dries out any more than it does with the manufacturer's lid. I have had to remove the Mixing Mate to remove a skin on the paint after several years of storage, but I have had the same issue with the manufacturer's lid and consider this the result of the air left in the container, not failure to seal. Paint Lid makes job easier. This is a great product to keep your paint available while working on a project. Easy stir, easy pour, no mess, easy cleanup. I like it! I paint with volunteers at a large charity organization. These paint lids are great, easy to use and no more paint draping down the sides of the cans. Paint stirs in seconds and the maple syrup pour spouts are fantastic. It makes using a stir stick a thing of the past. I really like the way you can stir, mix & pour right from the can with no spills or mess to clean up. Saves on the expense or having to buy more pain than is necessary to "get 'er done", so to speak. Love it! Much less mess with the can and less paint spilled. Great way to store, mix and pour paints easily with no mess at all. Have one on all my cans of lacquer finishes and they work great. Easy to stir, pour and store. They also clean easy. This is the greatest thing for painting. I wish it was a little cheaper so I could buy a couple more. Got the gallon and the quart. Love both. It is always hard to know what to do with paint that you are done using but not ready to throw out. This allows to store it and then when needed to mix so that it looks like it is supposed to. I love the Mixing Mate!!!! No more messy pouring from the can. I actually look forward to the task now... Mixing Mate makes it fun! And it works! Was very impressed with the mixing mate , I used to stir all my paints with a stick . Not after purchasing this . It works so easy and I love that it has a spout to pour paint . Now I want two more for quart cans . Easy to use and store. Will most likely by more as needed. Works as advertised. Secure fit, easy to stir and poor. Cleaned up well. Fantastic product! We but our first and second coat on our unfinished deck. Took just a few cranks to have mixed. The pouring spout didn’t allow one drop. The top is locked down tight with no ability to spill. I will be buying more of these as I go with painting the inside. VERY CONVENIENT as we are working in small increments in each room of our house. Saves time by not having to pour paint back into the gallon can. Everything in one place: storage, mixing, pouring etc. I always hated painting with gallon cans. You could never (easily) pour the contents into a tray. Problem solved. This unit maintains a tight seal so no drips or runs. It cleaned up easily with a little help from a Scotch-Brite pad. One suggestion before using; make sure the paddles are higher in the can. It's very hard to raise the paddles but easy to lower them to bottom of can. Highly recommended. 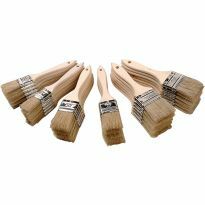 Keeps paint fresh and eliminates messy paint sticks. I love these. They are fantastic at mixing everything from lacquer to paint. I own 13 of them. You will love the ease with which this tool allows you to fully mix a partial can of paint. It will work on a full can too, but you will want to remove about a cup of paint before you use it or the can will run over as you stir. Works fast and does a good job of remixing anything that has fallen to the bottom. I have both the quart and the gallon size and recommend both very highly. I must recommend these Mixing Mate. I have had these for years (and the smaller ones) I have purchased them and my daughter buys them as stocking fillers for me. They do a brilliant job of mixing and storing paint. And the paint is always as good as new. 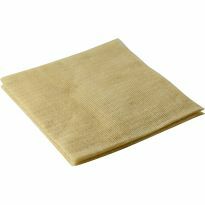 A paint filter is recommended on old stored paint but it never seems to form a skin on stored pain. So as before I recommend these. 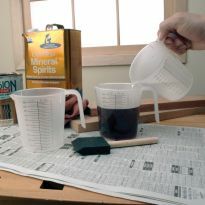 This is a very clever and functional way to store, stir and especially pour paint. I bought one and then got two more for different colors. The seal works well over time. It stirs the entire can and it is easy to clean. Really good. These mixers are a lifesaver. No need to open lids over and over again to mix paint. Just put it on once, mix paint, use, and store. Itâ? ?s that simple. Great product. Thatâ? ?s why I bought 2 of them. Need to buy more. I love this mixing tool! Best invention ever for making the task of painting much easier. This is sure a great asset for paint projects. simple to use. Does exactly what it's advertised to do. I own several of these. They make painting and clean up much easier. I stored part of a gallon over the winter [~7 months] and stirred it for a minute or two. I began my painting in less than 5 minutes. No problems!!! Love these mixing mate lids. Perfect for mixing and poring from base colors to mix custom colors. Previous one was stolen -- along with almost full gallon of paint. I liked it enough to buy another. Very handy for multiple small projects. Dose a great job and mixes very thoroughly. And it is easy to clean. I'm painting with paint that was sealed with this over ten years ago. This is a great money saver. So far, these are the best paint lids that we have used. We are a finish shop and are always looking for ways to improve our methods. This is one of them. It takes the mess out of pouring paint and a great way to mix too. Blends and pours paint effortlessly. Great item to have on any paint job and its can stay in place for storage. Just don't forget to rotate blender every so often. Ok so I could have used this product the very first day it hit the market. Sadly I waiting until now to get it. It has become one of two that I keep with all my painting supplies. I have no desire to return to the days of stick stirring. Best painting accessory ever! I always have a gallon of white paint with a mixing mate in it, and one at the ready for whatever color I need to touch up next around the house. Looks like the best tool for the job I have seen. I have a large project, I hope this will do the trick..
Was given one as a gift. This thing is amazing, keeps the paint fresh and no worries about spilling paint on the floor when I'm trying to pour it into the pan. Bought two more so I could have one on a primer can and a paint can. I have 1 gallon size and 1 quart size. they work great. would like to have second gallon size for trim color when I'm doing a painting project. To keep material mixed & easy pour feature. It will make life easier getting clear finish mixed thoroughly. I liked the item price with the discount. Mixing paint for spraying is complicated and messy. The product looks like it will work well. This product looks like it will be a big help, plus all of the 5-star ratings and comments on the quart size sold on The Grommet. Always in the need to keep paint mixed and ready to use the day after. I've previously used this product for a gallon bucket of stain, now I'll use this to mix some paint. It works great and makes life easier. All other reviews praised its benefits in terms of mixing and storage. My wife is into painting and touch-up after our house shored. Maybe I can get her to stop storing the paint tray in the refrigerator. Broke one when can was dropped. Need spares. Looked for something to mix and pour without constantly removing lid. For myself and for gifts for friends. Ease of use and, reviews were good. I was looking for a no-mess stirring lid for an automotive paint and a primer that I use frequently. This fit the bill perfectly. I do a lot of painting and I love the idea of having a drip free can to pour from . I already have one That I use to mix Fluid Film with and would like to have a couple spares kicking around. Great product for stains in gallon-sized cans. Can mix, pour, and store! I paint almost everything using the same primer and the same color paint. It has always been a pain to shake them and pour them into the paint tray. These appear to solve both issues. As a shop teacher hoping this will be a easier seal for the stain. The info says it works with water or solvent based finishes - specifically, will it work with lacquer? BEST ANSWER: I had no problem with lacquer based paint or conversion lacquer. Cleaned up easily and did not seem to soften plastic. left on can for 4 days. not sure if i would leave on for extended periods but clean up was easy so not a problem. Michael, I am sorry to say that we have only used this item with enamel and latex paints and it works GREAT! My wife loves this tool. It really has saved us money on paint. It really does what is presented. As for the lacquer, I cannot say if it will work. My concern would be the actual clean up of the tool if you are thinking of using it for paint afterward. Also, the moving parts might become very sticky and gummy. I am sorry I can't give you more information, but maybe this will clarify things a bit! Sorry, i can not help with your question. I can say it works great with latex paint. Maybe in future i will use with lacquer. Don't know michael ...I have minwax poly in mine ...have yet to use it so I don't even know if it works for this ! I've been keeping mine in lacquer for years, no problems. I love this guy! Will it hold up to lacquer and lacquer thinner? I dont know. I bought both sizes but am reluctant to leave them soaking in lacquer. You would think Rockler should be able to to answer the question. Is this compatible with automotive paints like urethanes and epoxy primers? I have been using the gallon size with a 2K Deft Urethane for about a year and it has functioned properly. 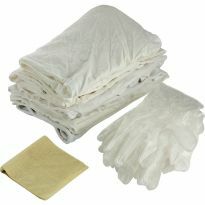 No air leaks, no incompatibility with the urethane or the cleaning solvent. This is a truly wonderful product. Will this fit on plastic cans with screw on lids, like Dutchboy? BEST ANSWER: It fits on the can but it does not seal the air away ....I will not be using mine again I wasted almost a full gallon because it skinned over and I could not break thru the skin. It has a wide silicone seal on the inside of the lid. I use it on plastic cans all the time. They are snap fit though, not screw on. will this work as a vacuum? BEST ANSWER: I have no idea. It works really well to mix paint and it will keep the paint fresh for a number of weeks. I am not sure what you are asking. If you are asking if this will work as a vacuum pump or if you can evacuate the container upon which the unit is mounted and it will maintain the vacuum, both applications go well beyond the design of this product. 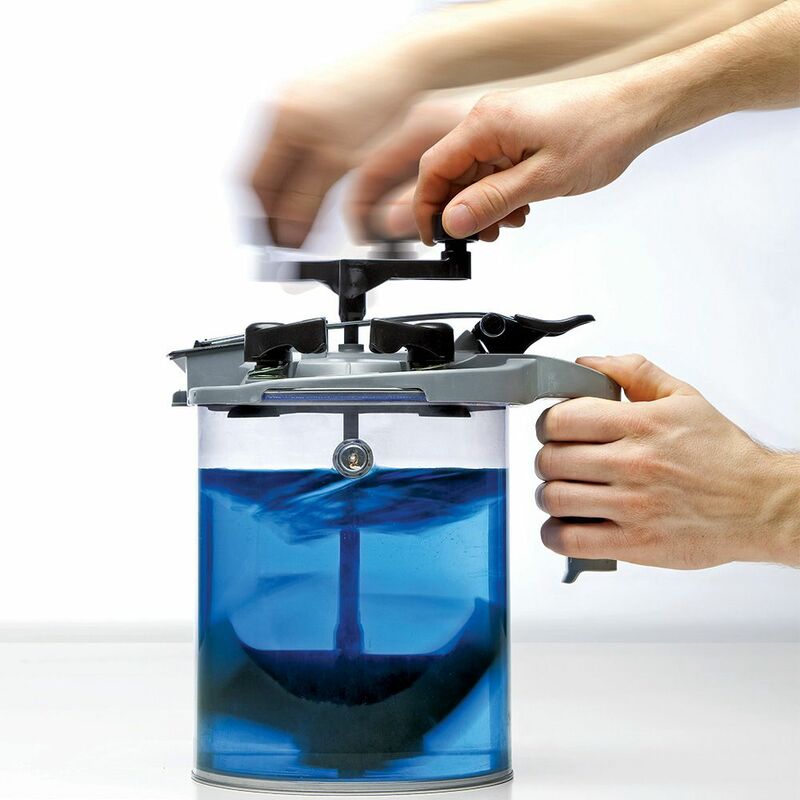 The Mixing Mate is an outstanding product and works very well for which it was designed. The mixing mate is a paint stirring device, not a vacuum cleaner. If you are referring to something else, then I don't understand the question. It says to use on metal paint cans, but some of them are plastic with metal tops. Will it work on those? I have eight of the Paint can pouring lids, They all work great except after leaving the lid on the paint can for a week the turning knobs that hold the lid on would not come off. Three of the four broke. Are these not for storing paint? and also can I buy replacement turning knobs. BEST ANSWER: Do not store the lid in SOLVENT for 24-hours because the rim to can's gasket will eventually fall off due to the strong solvents attacking the adhesive. You can safely store the lid in most finishes for months with minimal solvent evaporation. They do not need to be stirred every few days. well, the instructions mention that lids should not be left on a can for more than 24 hours. Having said that, I have stored paint in cans with these lids for a couple weeks without incident. The 24 hour answer is best, but if you use this paint regularly, just give the handle a few spins every day or two at the most. I have done this for up to three weeks. Will this fit UK size cans ? BEST ANSWER: This fits a 6-1/2" diameter can. UK 2.5L cans are 61/4" diameter will it still fit ie:- is the lid adjustable? the tins I us are 5 1/2" across, will they still fit as I want to buy one, but can not get them in England so have to buy from the USA . The British Imperial gallon is 25% larger than an American gallon (160 ounces vs. 128 ounces). Due to this, there is no way to make a lid compatible with both measuring standards. You'll have to wait until and if a British version is made. Hi Jim, many thanks for taking the time to reply to my question. Mixing Mate gallon lids will NOT fit UK 2.5-Liter cans. They will fit gallon, 3.5-Liter, and many 4.0-Liter can sizes. For the quart version they will fit quart and all liters except U.K. liter cans, which are short and "squatty". No they are not. They were designed in France and the tooling was transferred to a company-owned manufacturing plant in China with strict quality controls. Interested in using this with food coloring and food items. Can anyone confirm if the plastics used on this are food safe by chance? You are taking a HUGE risk by using this for food service and gambling with the health of anyone you serve food to. Spend a few more bucks and buy something specifically made for food service - unless you only cook for yourself. Is this offered in a larger size? I would like one for a five gallon container. Is it suitable to use on UK 5 ltr paint cans? BEST ANSWER: Sorry no, this will not be compatible. what is the maximum viscosity this can mix? First time I used the gallon size, one of the plastic paddle fins broke and it is totally useless. 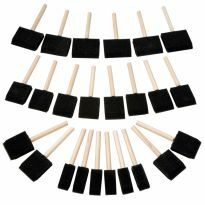 Does any one know if the plastic paddles are available for separate purchase? BEST ANSWER: I had one of the closure locks break. Took it back to the store and they replaced the complete unit. What diameter paint tin do these fit? The ones I require to use it on are approx. 19 cm diameter. Rockler Mixing Mate® Paint Lid, Quart Size - Stir, Pour, and Store!